Research opportunities can provide valuable experiences for medical students by enhancing what students are learning in the classroom, helping them become more well-rounded physicians, and opening doors for residencies and future career opportunities. It also gives them opportunities to begin contributing to advances in science and medicine at the earliest stages of their careers. Our clinical and science faculty are engaged in an array of publicly and privately funded research projects. 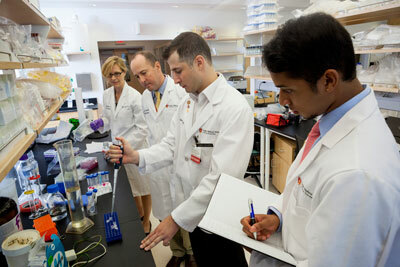 Last year, CMSRU faculty received nearly $10 million in research funding and published 433 scholarly research articles. Our faculty members are committed to mentoring medical students with specific research interests and providing opportunities for involvement in important scientific and medical research. At CMSRU, we offer a robust Student Summer Research Program with opportunities for students to choose clinical or laboratory projects. Students interested in particular fields of study are matched with relevant projects and mentors. Positions are made available by the Associate Dean of Research in winter to begin work the following summer. These opportunities are offered by researchers at CMSRU, Cooper University Hospital, and Rowan University. Examples include determining specific cells involved in healing the body, evaluating the effects of different drugs on the neurological system, testing the efficacy of new drugs in cutting short the progression of diseases, and more. Many CMSRU students have gone on to present their findings at national conferences and others have been published in leading journals such as the Open AIDS Journal, Austin Journal of Radiation Oncology and Cancer, and Resuscitation. Each spring medical students, residents, fellows and clinical staff from Cooper University Hospital participate in an annual research poster competition known as The Camden Scholars’ Forum. Students must have abstracts accepted to be eligible for this event. Research posters are displayed in Cooper University Hospital’s conference space over several days, where they are judged by senior clinical faculty members. Winners from each category present their posters during a special forum held in the CMSRU auditorium. In 2015, 34 abstracts by medical students qualified for the forum in case study, performance improvement, and clinical research categories.